Each Tuesday, nine year old Karlee Schuler pulls on her riding boots in anticipation of her horseback riding lesson with Mounted Eagles Therapeutic Horseback Riding Program. Mounted Eagles, located south of Brainerd, is a favorite weekly activity for Karlee who has been riding for about four years. Karlee has been diagnosed with a mild form of cerebral palsy due to a traumatic birth. Horseback riding helps to strengthen Karlee’s core muscles to improve her overall balance and abil- ity to stand up straight. While in the saddle, she works to keep her heels down which helps to stretch out her tight leg muscles. 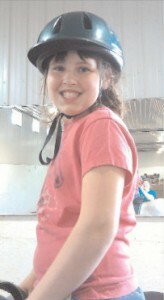 Karlee has become a very confident rider and likes to show off the trophies and ribbons that she has earned. She eagerly mounts her riding partner Rosie, a pretty little white Arabian mare. Horse and rider move out together from the mounting block and complete their warm up walk around the riding arena. Next up are the stretching exercises performed on horseback to warm up Karlee’s muscles. She is now ready to ride independently and her volunteer riding coach removes Rosie’s lead rope. Karlee is asked to perform her turns and then steer Rosie through the cones. Karlee then flashes her contagious smile as she and Rosie move into a trot. Posting through a trot requires Karlee to use her leg muscles and she concentrates to properly complete her ride. Karlee’s parents, Krista and Mike, credit horseback riding at Mounted Eagles for Karlee’s increased confidence to try new things and her becoming much more outgoing. Karlee lives in Baxter with her parents, two younger sisters Bailey and Abby and two dogs, Zeke and Shelby. Karlee loves school but looks for- ward to summer weekends filled with the whole family going camping together. The family camping trips also include lots of swimming and fishing. Karlee likes to go bowling and her youth league team took second place this year. Between the camping trips this summer, Karlee has decided to give the sport of softball a try. Such a busy young lady. Karlee we are so proud of all that you have accomplished at Mounted Eagles. Keep up the great job!